UG! Comedy Show guarantees a great time out FREE at No Fun Bar NYC! Todd Montesi and Pat Rigby present awesome comics in front of a cool supportive crowd in the epicenter of hip NYC the East Village EVERY Tuesday Night! Featuring both established comic veterans you’ve seen on TV to the up and comers, UG guarantees a swell time all for FREE! 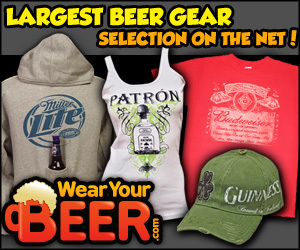 We’ve also got tons of drink specials (Half priced select drinks till 9PM)! So what are you waiting for? Come down and UG! it with us!!! Presented by Todd Montesi and Pat Rigby, every TUESDAY. Check here for the current week’s lineup. No Cover, One Drink Minimum with Half Price on select drinks until 9 PM. Check the map, mark your calendar and share it with your friends! Just show up with a smile on your face! Fees : FREE to Enter. 1 Drink Minimum. Comedy, Food, Drink. 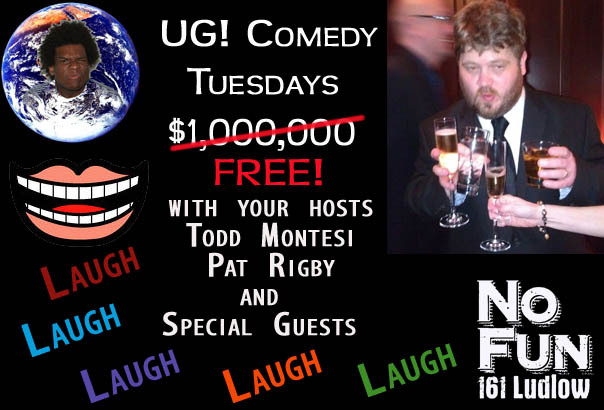 Event tags: comedy, FREE, laugh, pat rigby, special guests, todd montesi, tuesday nights. Registration Fees: FREE to Enter. 1 Drink Minimum.